While the Comment Challenge has ended the connections it created hasn’t. We loved the task aspect of the Challenge and wanted to continue but on a less intense basis. Our solution? Web 2.0 Wednesdays! Each Wednesday Michele Martin will post a Web 2.0 activity for us to try. Please feel free to join us and have fun while you learn. If you blog your post please tag your posts web2.0wednesday plus save it to del.icio.us with the tag “web2.0wednesday” — the posts and items tagged to del.icio.us are feeding into this page of our wiki. 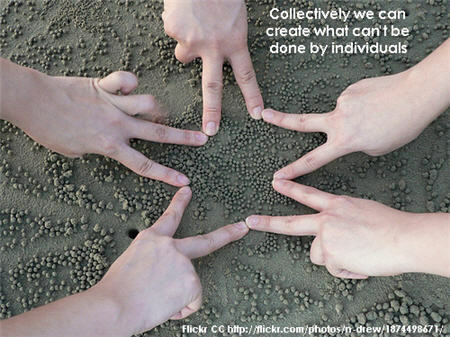 Janning provided these words “Collectively we can create what can’t be done by individuals” with this Flickr photo which I have combined to create the following image. Image adapted from N’Dr3W licensed under Creative Commons Attribution 2.0 Generic (Words on image supplied by Janning). I think we would all agree that collectively my network was considerably more innovative than what I could have achieved as an individual; thus demonstrating the true power of Web 2.0. Hope you join us for Web 2.0 Wednesday! Very creative and appropriate way to do this task, Sue, demonstrating one of the most powerful things with Web 2.0–the network. Very nice! A great image with message. Now, suppose I wanted to use this image combined with the text embedded within the image in my own presentations. I understand from what you wrote that Janning supplied the image and the text as two separate components and you combined them into a single image. What would be the correct process? Do I have to ask permission from both you and Janning? Is it your work or Janning’s work or both. Would a proper citation be to your blog where I saw it first and then include the text that you have in #3 above with all of the working links? In addition to actually wanting to know so I can in fact use the final image in presentations to colleagues, what are your thoughts about the increasingly complex nature of creative work as it becomes more and more a result of collaborative effort? Wonderful idea to use the most important feature in Web 2.o tools. The human factor!!! You have shown us that you have a wonderful network. @Michele Thanks. I’m just lucky I did it when I did as they have disabled replies on twitter at the moment which would have made it harder to achieve. Everyone was far more creative and innovative that I am. @Barry Excellent question. And as one of the commenters noted on my post on copyright and images – copyright is a complex topic. My personal decision is always better to over attribute than to under. Although in this case I haven’t made it easy. Let me explain why. To make it clear on how people can use my content I should add creative commons license to my blogs. If you used this Image I would suggest you copy and paste these words for under the image “Image adapted by Sue Waters from N’Dr3W licensed under Creative Commons Attribution 2.0 Generic(Words on image supplied by Janning). I would also link the photo to the original photo page on Flickr. @Jennifer I wish I had been able to demonstrate the network even better but I think the twitter issues are definitely impacting on this aspects. Glad to see that you have joined us for Web 2.0 Wednesday.